When it comes to tourism, Memphis is a very understated city, which is surprising considering the prominence of it’s part in 20th century blues and the famous alumni of musicians who found their big-break there. Those who do visit Memphis are often devout Elvis fans vying to fulfill lifelong dreams of walking around the infamous home where he’s now buried at Graceland, or blues fans seeking to enjoy the Beale Street live music experience that is so focal to their favourite genre. Indubitably these are two things which would be criminal to omit from your itinery should you ever find yourself in the mid-South, and they are central to what define Memphis, but there is something else that makes the city special. What that is exactly I don’t know, for it was an invisible sensation, but as somebody who isn’t overly, if at all, partial to the blues music which is the key characteristic of Memphis, the city still had another special something that caused me to start referring to it as ‘Magical Memphis’. It was Trek America that took me to Memphis. It was to be the stop between Nashville, TN and New Orleans, LA. The moment I saw it on the itinery I was excited, though mainly because I was amused by the prophecy of wandering through its streets singing a genuine rendition of Cher’s ‘Walking In Memphis’ (a favourite of mine, and incidentally one of the only two things that I knew about Memphis – Elvis being the other). We visited Memphis in November 2009. The weather was chilly yet surreptitiously sunny, the dim light consumed by the absorbent reddy-brown buildings and muddy waters of the Mississippi River which glistened in the Autumnal breeze next to our hotel. We had arrived in downtown Memphis having just spent an emotional couple of hours walking around Graceland, and those of us who hadn’t already been followers of the religion of the King of Rock’n’Roll had certainly been converted now. The tour around his house had felt like a journey back to the 1970’s, a period which none of us were familiar with. Everything had been lovingly left in the way the way it was at the time of his death. We had seen the ‘jungle’ room (a living space so-called due to the green shag-pile carpet which adorned it’s floorboards), explored his personal jet (complete with bottles of Gatorade he had tucked away for future consumption) and witnessed the infamous trio of televisions, all next to each other – Elvis liked to watch the news on three different networks at once… rockstars, hey? 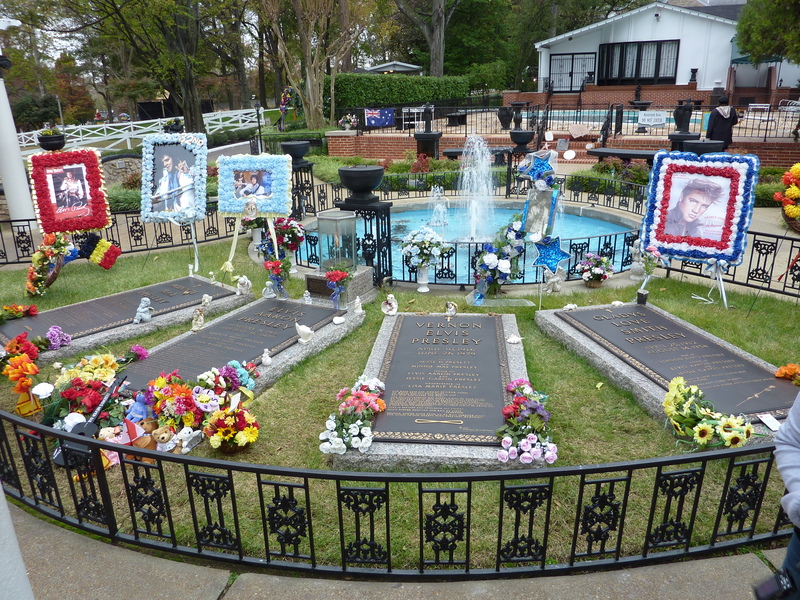 Finally, we had gone outside to the swimming pool at which Elvis and family were laid to rest; his tomb laden with flowers and souvenirs brought by his followers from all over the globe in a moving tribute to one of the most loved singers of all time. So by the time we reached our hotel, we had each taken the form of heartbroken teenage girl and were all a little subdued, having spent our journey along route 69 from Graceland mourning the death of that lovely guy Elvis (albeit 32 years too late). The perfect antidote to such feelings was to visit an All You Can Eat Barbecue. Yes, you heard right, an All You Can Eat Barbecue, meaning you pay the set amount and eat as much meat as you please. As you may be able to envisage, this meant that there was a hell of a lot of meat in that place – chicken thighs piled high on trays and barrels of barbecue sauce to ladle out at your will. This was typical USA. Forget the glitz and glamour of New York and Hollywood, this roadside grill complete with neon signage, obese waiting staff, noisy ice-cream dispensers and corn-dogs is the USA I really wanted to experience. 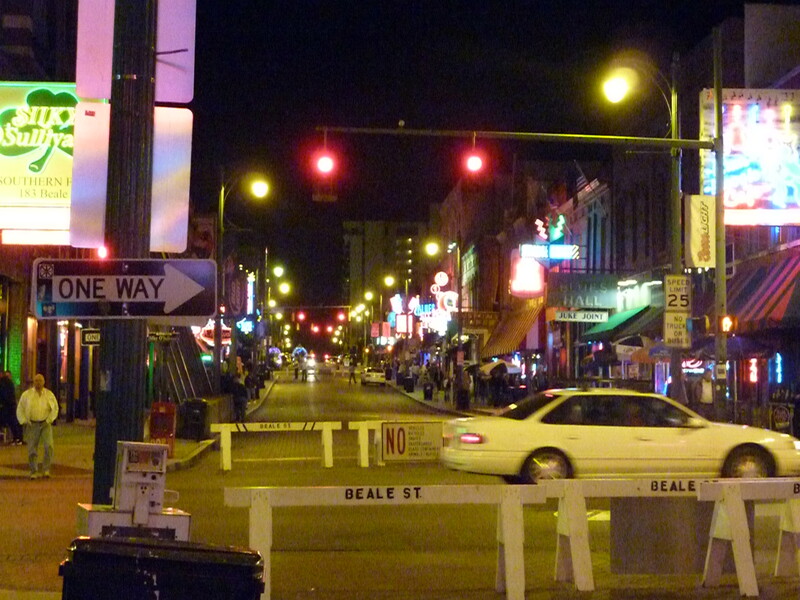 We finished the day with an evening of beer and music in Beale Street – the heartbeat of Memphis. The area boasted a number of bars to choose from, each with musicians on stage who probably all answer to the name Buck-Tooth Joe or Glass-Eye Gilbert performing in front of small crowds of bearded labourers in plaid shirts with forearms as thick as tree-trunks, holding firmly onto bottles of Budweiser and nodding their heads in time with the bass. The next morning, having caught glimpse of the fresh sunlight out of the window, my Australian roomie Bella and I decided to eat breakfast alfresco. We headed to a nearby cafe – I bought a muffin – and went and sat on a bench in the garden square next to the hotel surrounded by squirrels. Whilst eating we read through a list of inspirational quotes that were printed on the napkins the cafe had provided us with. I can’t remember word-for-word any of the sayings, though each one served a dose of warmth to the soul and as we read through them together we both marveled at how much sense they suddenly made. I could feel the spirit of Memphis tugging at my heart-strings once again and left the remainder of my muffin for a squirrel to enjoy. 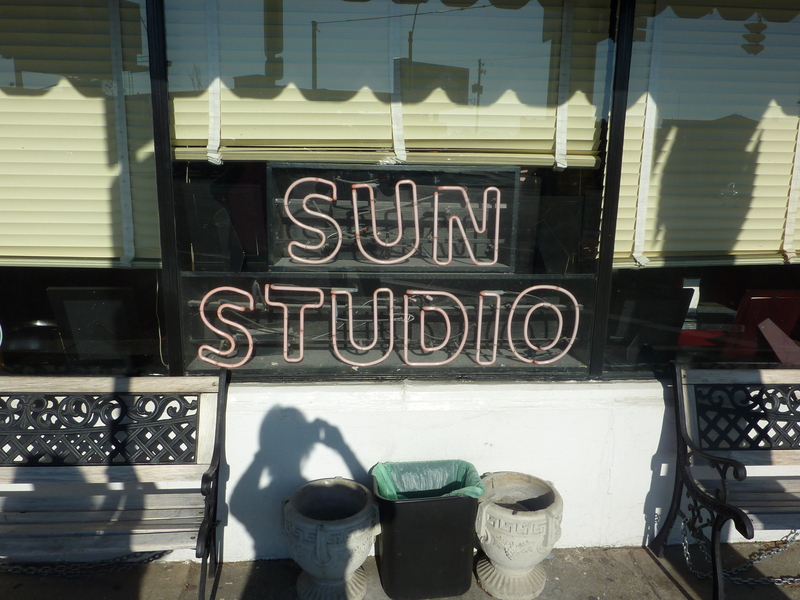 After a frustratingly slow start to the day due to having had difficulty working out how to use the hotel washing machines, a group of us strolled with purpose to the Sun Studios, another ‘must see’ place for all those who visit Memphis. Without prior knowledge of the significance of the recording studio it would have been easy to simply pass by this small corner-building on Union Avenue and think nothing more of it, but in reality this sixty-year old studio has been a key figure in the world of blues music and rock’n’roll. This was the building into which an 18-year old Elvis Presley would enter in 1953 to tell receptionist Marion Keisker that he wished to record a couple of songs as a gift for his mother. That liaison would ultimately prove to be the discovery of the King of Rock’n’Roll and we all enjoyed having our photos taken whilst stood on the area of floor cunningly marked with an ‘x’, holding a microphone – just like Elvis himself did on that very day in 1953. Memphis is a place dripping with soul, personality and religion. The population is 60% black and the city is home to the pentecostal Church of God in Christ. The people are friendly and inviting. Even the trams which trundle along Main Street give honks reminiscent of a happy ‘hello!’, and traders stand outside their shops all day long with broad smiles, being the very epitome of welcoming as they invite you in for lunch and a “special soda I’ll fix up for ya ma’am”. This is how we got lunch on the second day, as we sat eating nachos in a crafts shop whilst watching a boy-girl duet rapping along to some beats on stage. These people were happy to get to know us, asking each of us where we were from before discussing their home with us. Memphians are proud of their city and discuss it lovingly. When I mentioned the song ‘Walking In Memphis’ the shop owner immediately went out of her way to dig out an old recording she had of the original, by Mark Cohn. “Chers no original!” she was keen to point out and we finished our lunch in the atmosphere of that familiar piano sequence which identifies the song. That evening we went out for a bite to eat and started slowly walking back to our hotel when a man in a woolly hat approached us and asked if we wanted to a ride on his horse-drawn carriage back to our hotel. This is a popular way for tourists to get round in Memphis, and as there was a small group of us we thought we’d give it a go. Instantly when you hear the words ‘horse-drawn carriage’ you may think of a fairytale, and this is exactly how it seemed in reality, too. 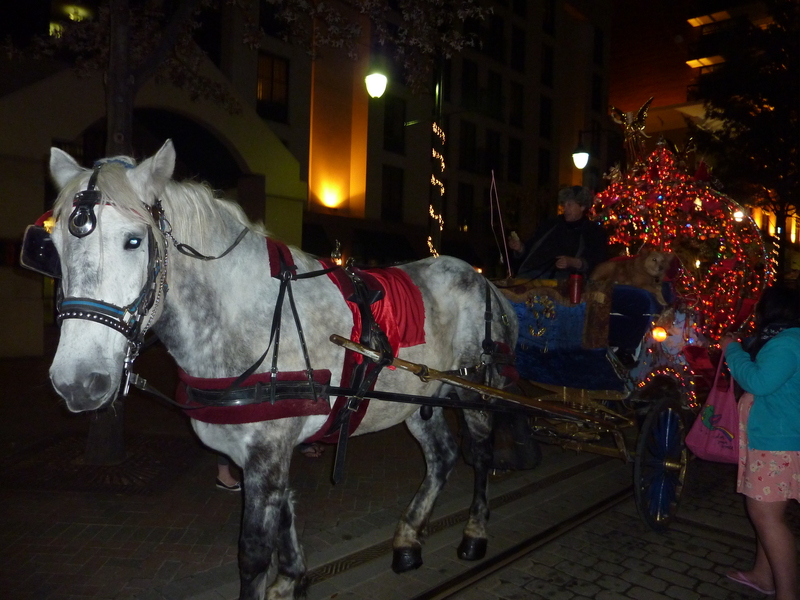 The carriage was decorated with colourful fairy lights, glowing bright in the evening’s darkness. Our coachman was a mysterious man, his hat and the night sky concealing most of his face. He had a gruff voice and sunken cheekbones, but he also had a dog alongside him, as well as his horse, and from the way he stroked them both lovingly you could just tell that here was a man who spent most of his life in the company of his two best friends. A happy man. We never caught the coachman’s name – or if we did, I can’t remember it – but he knew everything there was to know about Memphis, and he told the story beautifully. Whilst walking around in the daytime we had experienced the heart and soul of Memphis and felt welcomed into its wide open arms, but it was this carriage ride that proved to be the delicate, kiss-on-the-forehead farewell that such a couple of days deserved. “See that building there on the corner?” said the coachman in his southern drawl, motioning his horse-whip towards a vintage theatre on the corner of Beale St and South Main Street, “That’s the Orpheum Theatre. It’s haunted by several ghosts. Most famous one is a little girl called Mary. She was killed outside the theatre way back in 1921 and ever since, her spirit has been felt in the building. She can often be heard laughing or playing her favourite song, Never Never Land, on the organ. She’s even been spotted in seat C5 several hundred times”. We ooh’d and ahh’d at the building and revered in the coachman’s stories. There was not an inch of Memphis that he didn’t know about and as we approached our hotel he warmed us even more by telling the story of how Elvis had gone into a Spanish restaurant in the 1950’s and tipped a hard-up Memphian waitress with not money, but a brand new cadillac. The coachman dropped us off at the garden square next to the hotel, where we had eaten breakfast amongst the squirrels that morning. We paid him a generous amount in return for his knowledge and then watched him disappear again into the darkness. The good thing about being there in late November was that the Christmas lights were up around the city and as soon as we caught sight of that colourful bandstand, glowing in the night sky, we just had to take a dance underneath the moonlight. 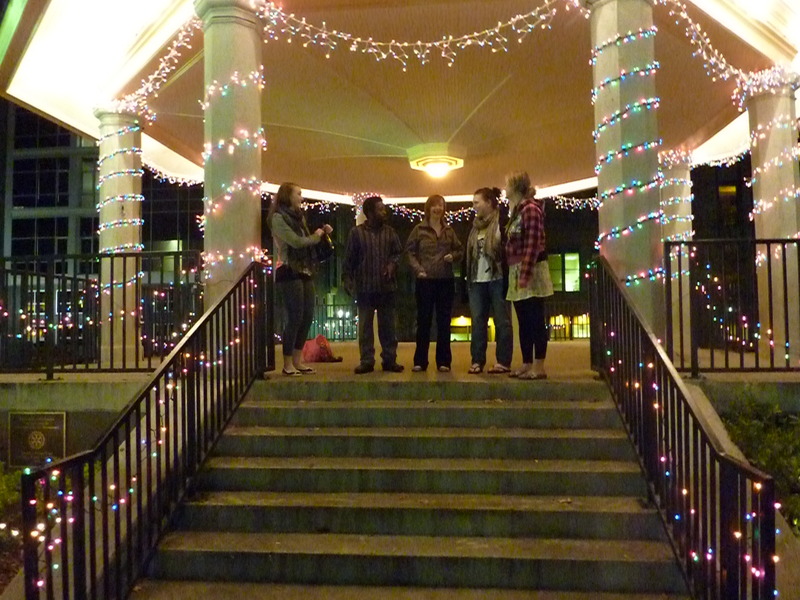 A homeless guy stood and watched us for a while,and asked if he could join us. He was harmless, but we had to be vigilant. We allowed him to dance with us for a while before eventually heading back to the hotel and dreamed of Memphis… magical, magical Memphis. Realistically, I don’t think I’ll ever go back to Memphis, but that’s certainly not because I didn’t love it. I did, but there are other places in the world I want to see and I’m just not sure what else there is to see there (apart from the marching ducks at the Peabody Hotel which I still kick myself for missing!). Additionally, it’s in a pretty awkward location far from the major transatlantic airports, but I’ll always smile to myself when I think of it, and especially when I hear Cher Marc Cohn sing that famous song… “…you got a prayer in Memphis…” I know I did.